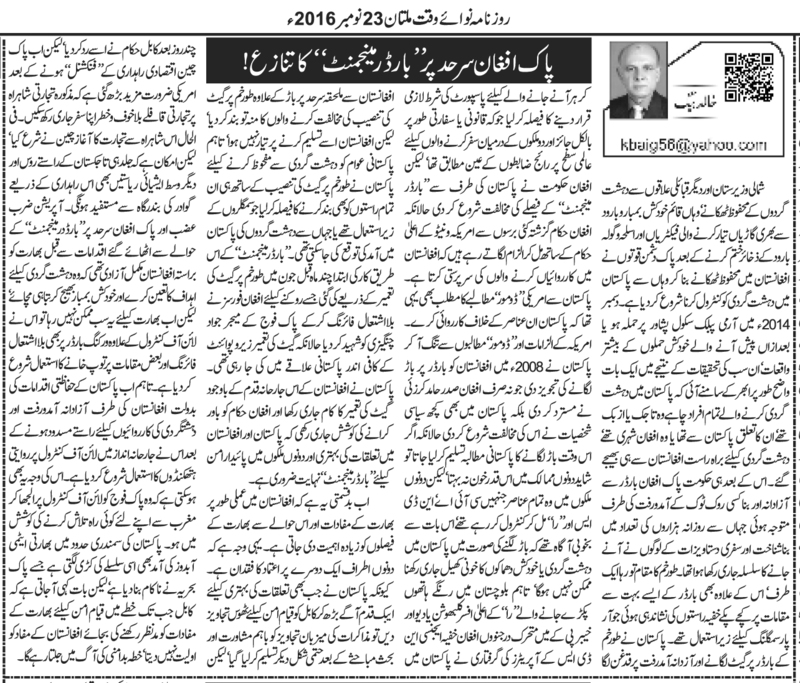 Truth by Kbaig: The Dispute Between Pak-Afghan on “Border Management”! The Dispute Between Pak-Afghan on “Border Management”! After cleansing of terrorists, their hideouts, weapon and suicide bomber jacket manufacturing factories and cache of munitions in the hands of Pak-army, anti-Pakistan forces has started to control and launch terrorists from Afghanistan. Whether it is the December 2014 attack over Army Public School Peshawar or other attacks in the series, one common fact that was found in the investigations that all the persons involved in terrorism whether they were Tajik, Uzbek, Afghan or Pakistani all of them infiltrated into Pakistan via Afghanistan. After these findings of the investigations, Pak-govt. 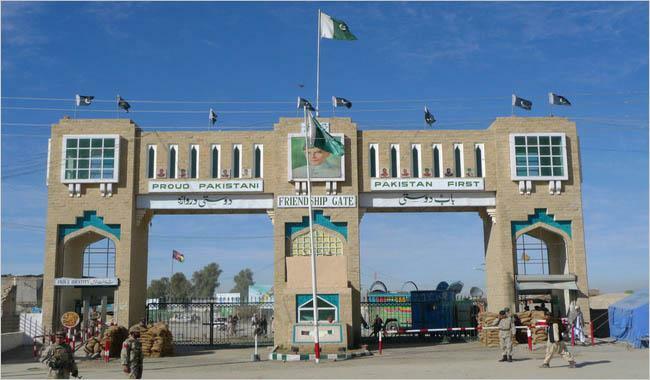 was forced to pay attention to the un-restricted movement across the Pak-Afghan border as thousands of people used to enter and exit Pakistan without any identity papers. Leaving aside the Torkham, there are hundreds of such entry / exit points which are being used for smuggling. By installing gate over the Torkham border Pakistan decided to enforce the movement across the border only after showing the passport. This decision of Pakistan was according to the legal and diplomatic rules for the movement in between two countries. Afghan govt. 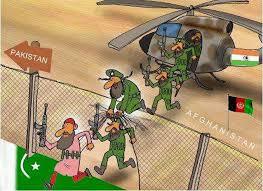 started opposing Border Management by Pakistan while Afghan govt. along with America and NATO officials have been laying false allegations against Pakistan that terrorists operate from Pakistan in the Afghanistan while Pakistan supports them. The American demand of DO MORE also meant the action against these elements. 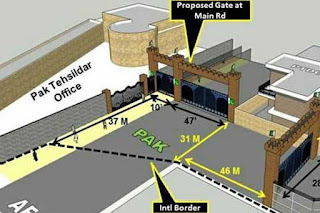 Pakistan proposed construction of wall over the border in 2008 after repeated allegations which was not only rejected by Hamid Qarzai but few elements within Pakistan also opposed it. If these demand had been accepted than both countries had not to see so much bloodshed in the hands of terrorists. But the elements within bother countries who are controlled by CIA, RAW and NDS were well aware that in case of construction of fences over the border it will be difficult for their terrorists to continue bloodshed and bomb blasts. 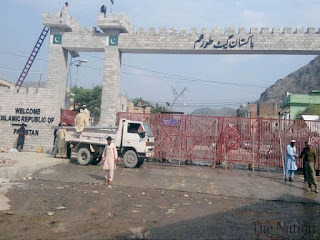 However, after red handed arrest of RAW officer Kulbhushan Yadev along with the arrests of dozens of NDS terrorist operators in KPK, shut the mouths of those who opposed construction of fence in Pakistan but Afghanistan was not ready to accept the construction of fence. In order to save Pakistanis from menace of terrorism, Pakistan unilaterally decided to close all those passes and ways that were being used by smugglers or terrorists. The Border Management started from the Turkham Border by construction of gate; Afghan forces started unprovoked firing in order to stop the construction work. In this firing Major Jawad Changezi from Pak-army embraced martyrdom. The construction was being done within the Pakistani area. 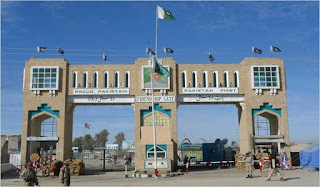 Despite of such aggressive act Pakistan continued the construction of the gate and continued the efforts to make Afghans realize that Border management is inevitable in order to control the terrorism. Irony of the fate is that Indian interests and Indian policies are given preference in Afghanistan. That is why both countries Pak-Afghan do not trust each other. Because whenever Pakistan presented any suggestions to Kabul for restoration of peace, they were accepted after negotiations but Kabul turned away from these mutually agreed suggestions within few days. However, after the Pak-China trade route being functional this is in the interest of the USA that trade caravans can move safely without any threat on this road. Only China has started trade from this route however, there are hopes that very soon Russia and other Central Asian states would also join trade from Gawadar via Tajikistan. Before start of Border Management and Operation Zarb-e-Azb, India was at large to select the target and infiltrate suicide bombers into Pakistan. However, this has now become difficult for India so she has started violations of ceasefire over LoC (line of control) by bombarding Pakistani areas adjacent to the border. These traditional Indian aggressive activities over border after her access to Pakistan for terrorism via Afghanistan were shutdown. India might have been planning to engage Pakistan army over the LoC in order to find out weak points over the Western point for terrorism. The sneaking of Indian Nuclear submarine into Pakistani seas seems to be the part of the series which foiled by Pak-Navy.